The first ever tea produced on British soil, our Classic Tea is the longest-serving and best-loved tea blend. 28g was first harvested from the estate’s tea gardens in Cornwall in 2005. A quintessentially English tea recipe, Classic Tea is blended with premium Assam leaves to give it the bold flavour synonymous with a strong, classic English tea. We think Classic Tea is perfect with a cream tea! 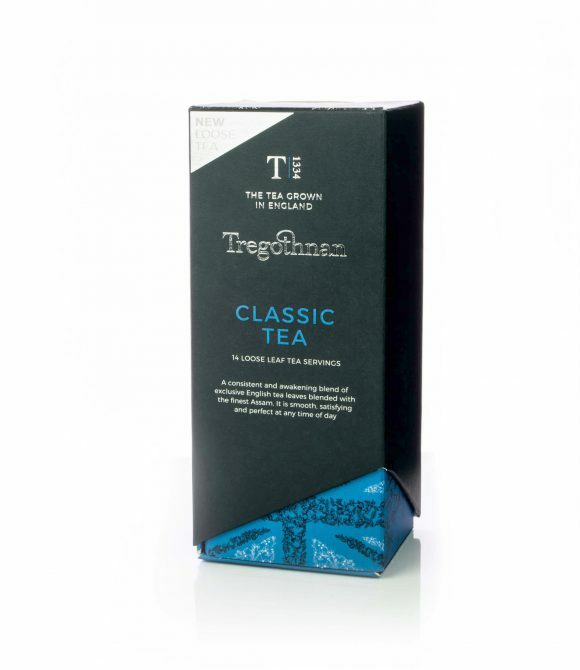 Each box contains 14 individually sealed Classic Tea pouches for ultra freshness, meaning your last serving of tea will be as fresh as your first.Tregothnan have measured the perfect quantity of loose leaf Classic Tea and sealed in the ‘bush to cup’ freshness into airtight foil pouches. Easy to brew, just open the pouch and pour the contents into your tea pot or infuser.